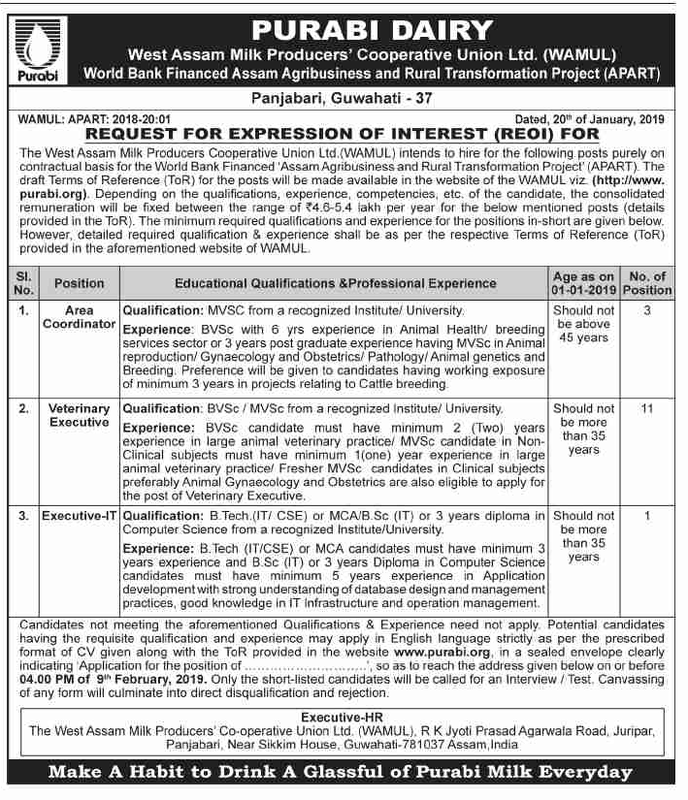 The West Assam Milk Producers Cooperative Union Ltd.(WAMUL)/ Purabi Dairy intends to hire for the following. posts purely on contractual basis for the World Bank Financed 'Assam Agribusiness and Rural Transformation Project' (APART). The draft Terms of Reference (ToR) for the posts will be made available in the website of the WAMUL viz (httpi/www. purabl.org). Experience: BVSc with 6 yrs experience In Animal Health/ breeding services sector or 3 years post graduate experience having MVSc in Animal reproduction/ Gynaecology and Obstetrics/ Pathology/ Animal genetics and Breeding. Preference will be given to candidates having working exposure of minimum 3 years In projects relating to Cattle breeding. Experience: BVSc candidate must have minimum 2 (Two) years experience In large animal veterinary practice/ MVSc candidate In Non- Clinical subjects must have minimum 1(one) year experience In large animal veterinary practice/ Fresher MVSc candidates in Clinical subjects preferably Animal Gynaecotogy and Obstetrics are also eligible to apply for the post of Veterinary Executive. Educational Qualification: B.Tech. (IT/ CSE) or MCA/B.Sc (IT) or 3 years diploma in Computer Science from a recognized Institute/University. Experience: B.Tech (ITICSE) or MCA candidatet must have minimum 3 years experience and B.Sc (IT) or 3 years Diploma In Computer Science candidates must have minimum 5 years experience in Application development with strong understanding of database design and management practices, good knowledge In IT Infrastructure and operation management. Age: Should not be more then 35 years. Remuneration: Depending on the qualifications, experience, competencies, etc. of the candidate, the consolidated remuneration will be fixed between the range of Rs 4.6-5.4 lakh per year for the above mentioned posts (details provided in the ToR). How to apply: Potential candidates having the requisite qualification and experience may apply in English language strictly as per the prescribed format of CV given along with the ToR provided in the website www.purabi.org, in a sealed envelope clearly indicating 'Application for the position of________', so as to reach the address given below on or before 04.00 PM of 9th February, 2018. Only the short-listed candidates will be called for an Interview /Test. Canvassing of any form will culminate Into direct disqualification and rejection. Address: ExecutIve-HR, The West Assam Milk Producers' Co-operative Union Ltd. (WAMUL), R K Jyoti Prasad Agarwala Road, Juripar, Panjabari, Near Sikkim House, Guwahati-781037, Assam, India. Advertisement Details: Pl check here .and Here .